The GNLF today said a delegation of party leaders led by Mann Ghisingh would meet Mamata Banerjee at Nabanna on June 20 at the invitation of the chief minister. Political observers said the meeting might be the formalisation of a political alignment that had taken on the Gorkha Janmukti Morcha in the Assembly elections. Harka Bahadur Chhetri's Jana Andolan Party, Trinamul and the GNLF had come together to fight the Morcha in the Assembly polls in the three hill constituencies. 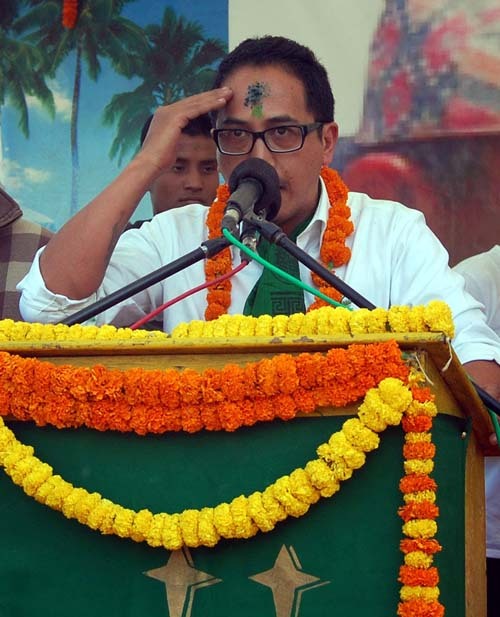 While Chhetri was the JAP candidate in Kalimpong, Trinamul contested from Kurseong and Darjeeling. N.B. Chhetri, the spokesman for the GNLF, said: "We had written to the chief minister sometime back expressing our wish to meet her. We have been invited for a meeting at Nabanna on June 20. Our party president, Mann Ghisingh, will be leading a six-member delegation for the meeting which is scheduled for 4pm." The GNLF had also backed Trinamul candidate Bhaichung Bhutia in the Darjeeling Lok Sabha seat in the 2014 general elections. Despite the support, the hill party couldn't cement its relation with Mamata Banerjee. In between the 2014 Parliament elections and the Assembly polls, GNLF leaders had met Mamata only once in Darjeeling. "We had met the chief minister once when she was in Darjeeling (after the Lok Sabha polls) but it was more of a courtesy call. Apart from that, our party president was invited to Mamata's swearing-in recently. This time, we are hopeful of the meeting. We also believe this would be the beginning of more meetings," said Chhetri. The GNLF delegation is looking at using the meeting to strengthen its ties with Mamata. "We have nothing in mind. There are many issues which we need to take up with the chief minister. But everything will depend on how the meeting progresses," said Chhetri, who is also a former Darjeeling MLA. The combined efforts of the JAP, Trinamul and the GNLF and also the support of chairpersons of development boards of various hill communities did give a tough fight to the Morcha, especially in Kalimpong. In all the three hill Assembly segments, the Morcha’s victory margin went down by nearly 50 per cent compared to the 2011 Assembly election results.